When my son was younger, we used to play a game. This was long before he had an iPhone and social media ran his life. We would sit in a restaurant, a park, or our car and play of game of “What’s Their Story?” We’d pick random people from all walks of life, and invent a sort of narrative for them. Name, age, backstory, marital status, you name it. To spark his creativity, I’d ask questions like “Where is she going? What’s his favorite ice cream? Why?” It was a great way to pass the time, and a way for me to encourage my son to use his imagination. Most of the stories were fun, outrageous, and silly. Very few were sad, and almost all of them had a happy ending. “OK, go on,” I’d prod. Then my son would become visibly uncomfortable. And that’s when the exercise would end. My son’s reaction to homelessness at 6 is typical of a person’s reaction at 26. Or 36. It’s too hard or too sad to think about. It’s draining. It’s a systemic issue and can’t be solved overnight. Plus, we’re just out here trying to live our lives, keep our own heads above water, right? How Do You Solve a Problem Like …? We’re designers. By its very nature our profession calls on us to identify a problem and then solve for it. That solution often makes things easier, more functional, provides more clarity, or… just makes things prettier. These are skills that we’ve honed for years. But what about your personal superpowers? What can you do in your sleep? And how do you leverage those superpowers to improve the world around you? Let me tell you what I’ve done. I’ve volunteered in the transitional housing space for more than a decade. I was going through a separation and divorce at the time, and just needed a way to refocus my energy. To redirect the attention from me and my pity party, and do something meaningful for my community. I began working with a shelter in Baltimore and most recently with a non-profit organization in Northern Virginia. Through my work, I’ve had the opportunity to witness firsthand the stories of many people who go through this eco-system. They are varied. They are not what you think, and they are exactly what you think. This problem, like all matters of life, is complicated. Not everybody is lazy. Not everyone has mental health issues or trouble with the law. Or is struggling with addiction. Some are young adults who have aged out of foster care. They were never adopted, so they remained in the system. And then when they become of age, the state is no longer responsible. That young person, that 18-, 19-year-old wasn’t set up for success. Wasn’t given a foundation. They don’t have a safety net. As many as 31 percent of former foster kids spend time homeless or couch surfing. Then we have some folks, mostly young, mostly women and children, but a few older people and men, who have had to flee toxic and violent homes. With not much, and no network. And some are just like us. Some of these folks have educations and good jobs. But their finances were built on a precarious house of cards. And one slight breeze can send everything tumbling. It happens more than you know. When we think about volunteering or giving back as designers, it’s easy to go with the safe choice. Let’s redesign a nonprofit’s website. Cool. Or improve the experience and functionality for an app. Sure. I’m a writer. It would have been easy for me to assign book reports to the kids or some other predictable language arts exercise. I’m sure their parents and teachers would have appreciated that. But to hell with writing. That wasn’t the need. Many of these kids were in shock and depressed. They gradually began to mimic their mom’s behavior, this tunnel vision of getting by day-to-day. Storytime was often me looking at them, looking at me, looking at them. Zero engagement. He would say this so much that our time together became a sad game of non-sequiturs. Would you like a juice box? “This isn’t my house, I have a house.” Or he would time-box everything. “I’m not gonna be here long. My mom’s getting us a house, so I don’t want to read.” Even slightly engaging would confirm that he was here. In this space. Let me tell you the story of the girl who cried (and made me cry) because she couldn’t attend a friend’s birthday party. The parents of a classmate insisted on mailing formal invitations to the birthday instead of sending e-vites or just handing them out in the class. The girl didn’t want to give out her address. Why? Because her family was staying in an extended-stay motel. She’d rather miss the party than be “exposed” for not having a proper home. I tell you this because what I could offer became crystal clear. These kids needed a coping mechanism. For many of us, our environment defines who we are. And for the most part, we as adults can control that. Children cannot control their physical environment. It is largely dictated by the adults in their lives. I decided to use my superpower and design a way out, for the kids. And it became my mission to help them realize that if we use our imagination we are not defined or confined by our environment. So, we went places. We went to Africa—specifically Ivory Coast. Right there in that recreation room in the shelter. We took turns being a griot, beating my son’s African drum and telling stories. We went camping, making s’mores in the middle of the room using an illegal toaster oven. We went to Mexico. Three siblings who had just arrived in the shelter with their mother, and were new immigrants to the U.S., played our tour guides and translators. And we ate Mexican candies. At 7 p.m., on a school night. Because why not? Can you imagine traveling to a new country, moving into what you think is going to be your permanent home, and then being uprooted to escape a dangerous situation? I can only imagine, but I bet I still wouldn’t be close to that very real fear. That’s why I flipped it. I wanted to empower this girl and her two younger brothers, make them feel comfortable. We were guests in THEIR country. 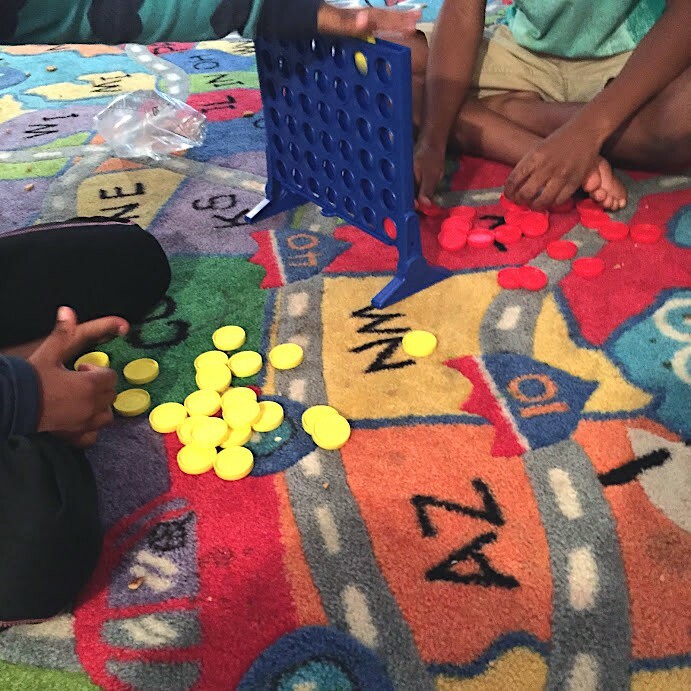 We learned how to outsmart bullies and be strategic by holding Connect Four tournaments. One of my favorite lessons involved creativity and expression. I told them a story about a man who lived a long, long time ago. (It was only about 50 or 60 years ago, but that’s forever to them.) I talked about how this man used a different method to make pictures. He was a painter, but most of the time he didn’t work the way we think most painters work. Many people thought his methods were weird, but they were actually pretty smart and deliberate. He wasted a lot of paint. He was messy. Many could never figure out what he was doing until it was done. He didn’t use his tools the way they were supposed to be used, but his pictures always came out so cool. Well, some people thought they were cool. And then I passed out bandanas, smocks and paints. I held my brush above the butcher paper and let the paint drip, to demonstrate one of the methods he used to paint. Then I wildly flung the paint in several directions. I asked the group, am I painting? Then I told them to paint a picture using any method, any tool, any way they wanted. And they did. “Can I use my knees?” Sure, I’ll clean you up. “Can I use my feet?” Yes. “Can I use my eyeballs?” No, we’re not doing that. Stop it. You’re doing too much. We were all artists. We were creative. It was exciting. We did it OUR way. And it was fine, normal, OK.
We got our Jackson Pollock on. There are highly functioning people who need emergency shelter in our communities. They are your baristas at Starbucks. Your dental hygienist, your kids’ classmates and friends, maybe even your colleagues. At Capital One, our remit is to improve, protect and enhance the financial lives of our customers. And that’s why the discovery phase is one of the most crucial parts of our jobs. It’s where that connective tissue around the entire experience begins to form. It’s how we orient ourselves to determine how we’re going to tackle a problem. So, Designers, as you begin your research, I implore you to make an extra effort to shift your thinking from US and THEM, to US and US. Because, frankly, there is no us and them in this work. Not if we are truly committed to the values we espouse daily. And, we won’t truly know the apex of what we can do for our customers until we make empathy a verb. Those of us who work and volunteer in the homeless space are constantly asking folks to conjure an existence in which they cannot begin to imagine. They’re just trying to make it day-to-day. Help conjure an existence where everything we design is FUBU: for us, by us. Now. Let’s get our Jackson Pollock on.